Pepperoni is an American variety of salami, made from cured pork and beef mixed together and seasoned with paprika or other chili pepper. Pepperoni is characteristically soft, slightly smoky, and bright red in color. Thinly sliced pepperoni is a popular pizza topping in American-style pizzerias and is used as filling in the West Virginia pepperoni roll. The term "pepperoni" is a borrowing of peperoni, the plural of peperone, the Italian word for bell pepper. The first use of "pepperoni" to refer to a sausage dates to 1919. In Italian, the word peperoncino (diminutive of peperone) refers to hot and spicy peppers. Pepperoni is a cured dry sausage similar to the spicy salamis of southern Italy, such as salsiccia Napoletana piccante, a spicy dry sausage from Naples, or the soppressata from Calabria. The main differences are that pepperoni has a finer grain (akin to spiceless salami from Milan), is usually softer, and is produced with the use of an artificial casing (Italian salami is produced using natural gut for casing and are made of pure pork). Pepperoni is mass-produced to meet the demand for the sausage. 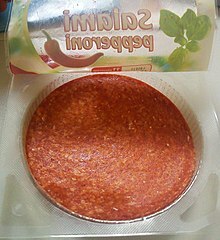 In most of Italy pepperoni would be considered a type of salamino piccante. Pepperoni is usually made from a mixture of pork and beef. Turkey meat is also commonly used as a substitute, but the use of poultry in pepperoni must be appropriately labeled in the United States. Curing, with nitrates or nitrites (usually used in modern curing agents, to protect against botulism and other forms of microbiological decay) also contributes to pepperoni's reddish colour, by reacting with heme in the myoglobin of the proteinaceous components of the meat. According to Convenience Store Decisions, Americans consume 251.7 million pounds of pepperoni annually, on 36% of all pizzas produced nationally. Pepperoni has a tendency to curl up from the edges in the heat of a pizza oven. Some pepperoni is produced in thicker slices, so that the edges curl intentionally. In Nova Scotia, deep fried pepperoni served on its own (usually with a honey mustard dipping sauce) is common pub food. Pepperoni atop a pizza, above the diagonal cuts. A cooked pizza with pepperoni showing distinct curling. ^ a b "Pepperoni is Raw Meat?". HOW FOOD WORKS.com. February 2009. Retrieved 7 June 2017. ^ Moskin, Julia (1 February 2011). "Pepperoni: America's Favorite Topping". The New York Times. Retrieved 11 May 2016. ^ a b c Moskin, Julia (1 February 2011). "Pepperoni: America's Favorite Topping". The New York Times. Retrieved 22 April 2013. ^ "America's Most Popular Pizza Toppings". Huffington Post. 5 October 2011. Retrieved 22 April 2013. According to a survey done by Technomic’s MenuMonitor from July to September 2011 based on 235 different pizza places in America pepperoni and plain cheese were the #1 and #2 most popular pizzas ordered. ^ "Salumi tipici italiani: Salsiccia - Salsiccia Napoletano - Salsiccia Siena - Salsiccia Toscana". Agraria.org. Retrieved 2016-02-04. ^ "Soppressata calabrese". Ricette di Calabria. Retrieved 2016-02-04. ^ Food Standards and Labelling Policy Book, USDA, pp. 133–134. ^ Flippone, Peggy Trowbridge. "A Recipe to Make Authentic Homemade Pepperoni". The Spruce. Retrieved December 12, 2017. ^ "Pizza Palates Changing". Convenience Store Decisions. 2009-06-01. Retrieved 2013-04-25. ^ López-Alt, J. Kenji (December 2012). "The Food Lab: Why Does Pepperoni Curl?". Serious Eats. Retrieved April 22, 2013. ^ Eat This Town (1 February 2016). "Nova Scotia Food Profiles: Pepperoni". Eat This Town. Retrieved 7 January 2018. ^ Brown, Lola (2 April 2013). "You Must Try: Delicious Deep Fried Pepperoni in Halifax, Nova Scotia". Travel Mindset. Retrieved 7 January 2018. Smith, Andrew F. (2007) "Pepperoni". The Oxford Companion to American Food and Drink. p. 447. ISBN 0195307968.